Elegant Findings Antiques has been specializing in beautiful antique porcelain for thirty years. I have had years of experience buying and choosing antique porcelain that other collectors love and have learned a wealth of information over the past thirty years. I have truly enjoyed learning from my experiences. I feel it would be helpful to other people to share some of the learning experiences I have had. Tip # 1. Condition, Condition, Condition! Always try to buy antique porcelain that is in great condition. Do not buy porcelain items that are chipped, cracked, scratched or repaired. Look over each piece well with a bright light for imperfections. I always look for antique porcelain items that look like they were made yesterday. People say that most of my items are in perfect condition. The reason for this is that I am very selective. Tip # 2. Quality and Beauty. Buy each piece of antique china for its beauty, quality and condition. Do not buy it just because it was made by a famous company. I have found that each of the famous porcelain companies have made pieces of porcelain that range from poor quality and beauty to fabulous quality and beauty. You must love each item before you even look at the company's name that made it. If you love the workmanship on the porcelain item, this is an indication that you should invest in it. Tip # 3. Rarity. Try to buy pieces of antique porcelain that are rare and unusual. A common item may not be a great investment. It is the idea of supply and demand. A discontinued pattern that is very popular with the public might still be a good investment. A rare item will usually be desirable to many collectors. Tip # 4. Detail. Look at the detail. I prefer pieces of antique china that are hand painted or hand gilded beautifully like a work of art. Invest in a magnifying lens. If the porcelain item is designed using a decal or is transfer printed, you will see little dots across the item when you look at it closely with a lens. If it is hand painted, you will see the detail and no little dots. Items that are hand painted by talented artists are the most valuable. Some artists that painted on antique porcelain spent their whole life perfecting their talents. Certain artists specialized in painting portraits, others painted flowers, others painted seascapes and other artists painted fruits. They were fabulous artists that painted on porcelain rather than canvas. There were other artists that spent their whole life perfecting the art of raised gilding on plates, vases and other porcelain forms. This was an art in itself. Tip # 5. Modeling of Figurines. If you are buying a figurine, look at its detail and think about its rarity. 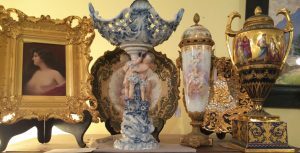 There are certain antique figural groups that have maintained or increased in value like Meissen, Nymphenburg, Holst, KPM and Royal Copenhagen. These are all hand painted and modeled by talented artists. In general, they have a much higher quality in their modeling of the figures and the painting of their details. You can see each hair strand, every finger nail and toe nail as well as eye lashes and eye brows. The painting is amazing! These pieces will never be done today as well as they were one hundred years ago. This is why they are considered so rare and beautiful. Tip # 6. Do Some Research. Last but not least, learn the marks that different porcelain companies put on the bottom of their items that help to identify the maker and the age. I would advise you to invest in books that help to identify the marks for different porcelain companies over the past three hundred years. Kovel's New Dictionary of Marks by Ralph and Terry Kovel is a great book to start with as it gives you a wealth of information at your fingertips. You will be surprised how many marks there have been for different porcelain companies over the past 300 years. It is a lot to learn, but it is fun to do the research. You will never get bored with the abundant information that you will find. Tip # 7. Buy From A Reputable Dealer. I would advise when you are buying antique porcelain to buy it from a reputable dealer with a lot of experience. They will point out imperfections if there are any. They can tell you about the 6 tips to buying porcelain that I just discussed I have had wonderful experiences collecting and selling these porcelain items. I try to point out every detail in the areas we just discussed, so even the novice buyer will feel comfortable purchasing an antique porcelain piece. I hope you will have a wonderful experience and journey into the fabulous world of collecting antique porcelain. Elegant Findings Antiques has many pages of beautiful porcelain items for you to choose from to add to your collection. Please go to my Antique China page or to any of my menus to see the extensive selection of antique china Elegant Findings offers. Happy Antiquing!